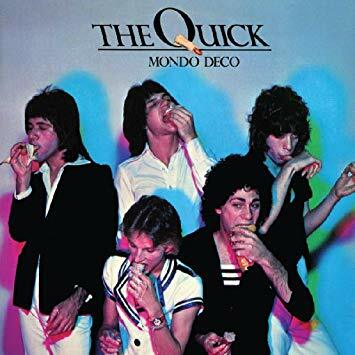 Los Angeles-based Power Pop band The Quick may have only put out one album in their short existence, but that one record, Mondo Deco, helped to bridge the gap between glam music and the then burgeoning punk rock scene. Real Gone Music is putting out the band’s sole official album on CD for the first time, cramming it with 10 rare demos and an unreleased track (an outtake of the fantastic “Anybody”). The band, which boasted Danny Wilde, who would go on to form Great Buildings and later The Rembrandts, also had future members of The Weirdos, The Three O’ Clock and the Cruzados. Listening to Mondo Deco now it’s almost unimaginable that this band didn’t go onto to be as big as groups like Slade or Cheap Trick. They had strong guitars, sharp pop hooks and Wilde’s fun, high-pitched quirky delivery showcased throughout an album without a bad song on it. Kim Fowley managed the band and got them the initial deal with Mercury Records. The band was even able to talk Earle Mankey from The Sparks into producing them. Listening back on the record more than four decades later it seems odd that The Quick didn’t find success with this one and even odder that Mercury didn’t offer them another shot. Though it’s certainly not heard to believe that the rumored dust up with the notoriously petty Fowley had more than a little to do with the band’s fate. The album came out in 1976 and by 1978 they played their last show. Songs like the raucous “Anybody” or the goofy, but hard to resist “Playtime” sound absolutely timeless even today. Over the years, everyone from Redd Kross to the Dickies have cited this record as an influence, so it’s a shame it took so long for Mondo Deco to get a proper re-release. Thankfully that’s finally been rectified here.